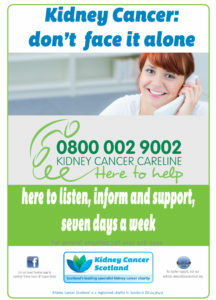 This section of the website describes the patient kidney cancer support services available for kidney cancer patients and their families. You can share your thoughts with others and get information, help and support through our online closed Facebook patient and carer forum or by ringing our national Kidney Cancer Careline on 0800 002 9002. Alternatively, our Living With Kidney Cancer days, held throughout the UK, provide patients and their families with much needed information about treatments, diet, patient support and how to deal with the side-effects of drugs. Patient days are also a good place to meet and chat to other patients. Click on the Kidney Cancer tab to access a wealth of information about kidney cancer, including our Understanding Kidney Cancer Booklet and kidney cancer fact sheets, written specifically for kidney cancer patients and their families. You will also find the latest National Institute for Health and Clinical Excellence (NICE) guidance documents, the Map of Medicine Health Guides for the management of kidney cancer and the European guidelines for the treatment of kidney cancer, to download from this page. We have written a very comprehensive kidney cancer glossary of common words and terms that you might come across, in addition to a list of frequently asked questions with answers. There is also a list of links to websites with further useful information about kidney cancer and the practicalities of living with the disease. We have produced a poster for hospital clinics and GP surgeries to help raise awareness of the work we do to support kidney cancer patients. Please email if you would like copies for the benefit of your patients. If you prefer, you can download a PDF file to print copies of the poster by cliking the poster below.